St. Therese Church - Heidelburg, Ky. When considering the role of the Catholic Church in Kentucky outside the "golden triangle," one immediately thinks of the central Kentucky region around Bardstown and Lebanon where many Catholics settled in the nineteenth century building a strong church and faith. One, however, does not immediately think of the hills of eastern Kentucky. 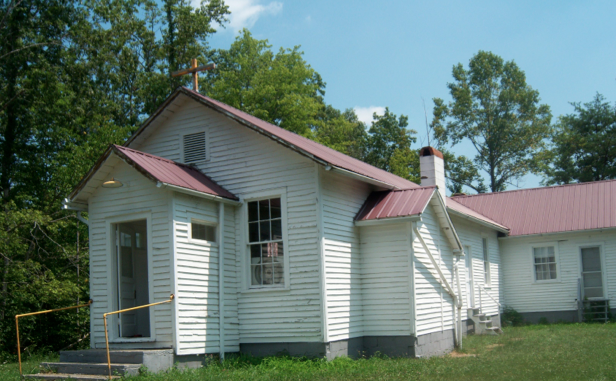 Although Catholic families can trace themselves to eastern Kentucky communities long before, it was not until 1927 that a Catholic church was established in eastern Kentucky. 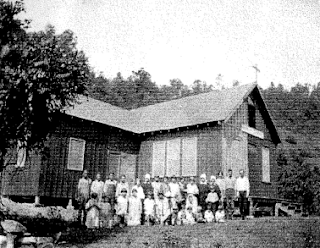 In Lee County's Heidelburg community, four families established St. Therese at Contrary Creek "down in the holler." Families worshipping there had as much as a two hour trek by foot to reach the small church by Contrary Creek. In the 1940s, the decision was made to relocate the church onto the mountain above the holler. In 1948, the present wood frame clapped board church was constructed with its materials being reused from the old church on Contrary Creek. Its white siding and red roof are in stark contrast to the lush, green forest that surrounds it. Regular services ceased in the 1990s and since 2001 the Catholic diocese of Lexington has designated St. Therese as an oratory, or house of prayer. After recommendation by the Kentucky Heritage Council's Preservation Review Board, the National Register of Historic Places included St. Therese Church into the register on February 28, 2012. With hope, this designation will enourage and promote preservation at this house of worship.